We’d love your help. Let us know what’s wrong with this preview of Stones of My Accusers by Tracy Groot. 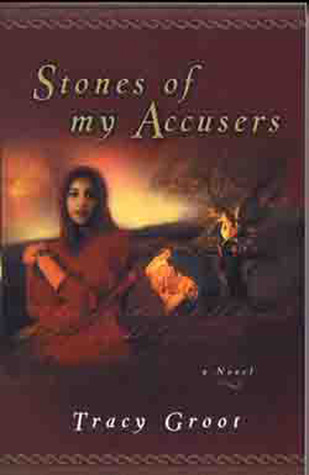 To ask other readers questions about Stones of My Accusers, please sign up. I read Stones of My Accusers after reading Madman and The Brother's Keeper both by Tracy Groot. Stones of My Accusers picks up at the end of The Brother's Keeper with the characters of Jorah and Joab, and the heretofore unmet Rivkah, Nathaniel's prostitute mother. Orion, Chief Secretary of Cesarea Maritima figures prominently into the plot as he is sympathetic to the Jews petitioning him (of which Rivkah is one), while at the same time needing to keep peace with Rome. Things I liked about this b I read Stones of My Accusers after reading Madman and The Brother's Keeper both by Tracy Groot. Stones of My Accusers picks up at the end of The Brother's Keeper with the characters of Jorah and Joab, and the heretofore unmet Rivkah, Nathaniel's prostitute mother. Orion, Chief Secretary of Cesarea Maritima figures prominently into the plot as he is sympathetic to the Jews petitioning him (of which Rivkah is one), while at the same time needing to keep peace with Rome. ** The characters. It is certainly Tracy Groot's strongest feature - portraying full, vivid characters. ** The two romances - I'm a sucker for a romance, what can I say? ** Well, firstly, that I can't seem to find a description of Orion's appearance anywhere in the book. I might have missed it (I did a bit of skimming in the beginning, I admit.) I have gone back and tried to find a description, but haven't yet. Orion's character and personality is quite clear. However an image of what he actually looks like isn't. This is unusual for Groot, so I suspect I missed it. ** The romance between Orion and Rivkah. While I liked it (see above point) I thought that the realistic probability of a viable, healthy romance between a Chief Secretary (he was directly under Pilate) in the Roman government and a prostitute was unlikely. Not impossible ... but unlikely. ** How quickly Jorah seems to get over Nathaniel. The publishers of this book Moody Publishers states their mission:"...to equip and motivate people to advance the cause of Christ by publishing evangelical Christian literature and other media for all ages around the world..." Given that, this book was remarkably free of "evangelical" language. Jesus is treated as a real person - the oldest brother of a large family and the "resurrection" is treated with skepticism by the main characters. The story does have a theme, but it's a universal humanis The publishers of this book Moody Publishers states their mission:"...to equip and motivate people to advance the cause of Christ by publishing evangelical Christian literature and other media for all ages around the world..." Given that, this book was remarkably free of "evangelical" language. Jesus is treated as a real person - the oldest brother of a large family and the "resurrection" is treated with skepticism by the main characters. The story does have a theme, but it's a universal humanist one of the fallibility of people and the need for forgiveness - thus the reference to the "he who is without sin cast the first stone" in the title. This follow up to Groot's novel My Brother's Keeper isn't as good but does give some satisfaction in finding out what happens to some of the main and secondary characters in the first novel. Stories about Jesus's siblings are a rarity in my experience and I enjoyed exploring what that might have been like. The book also gave me a new appreciation for the miraculous spread and subsequent longevity of the Christian religion in a time period which contained none of the methods of instant communicat This follow up to Groot's novel My Brother's Keeper isn't as good but does give some satisfaction in finding out what happens to some of the main and secondary characters in the first novel. Stories about Jesus's siblings are a rarity in my experience and I enjoyed exploring what that might have been like. The Sequel to "The Brother's Keeper" and just as beautiful. "A captivating stand-alone sequel to The Brother's Keeper, Stones of my Accusers reveals the transforming difference Christ's mercy makes through the lives of several compelling characters. Joab and Jorah are each traveling separately to find a prostitute named Rivkah and inform her of her son Nathanael's death. Joab has been commissioned to take Nathanael's words to Rivkah ("Tell her, No sto The Sequel to "The Brother's Keeper" and just as beautiful. This book is set a few days after the certification of Christ. This book was well written, but I expected it more to be about Jesus's family. Instead, it takes readers into three connecting lives and how they work together to prove a man's innocence. It's a good story, and I do recommend people to read it, but just realize that it's not about Jesus's family and how they coped with losing him. This genre is considered historical Christian fiction, so it's meant for general audiences. although I did not read the sequel, I enjoyed this story. reading a story about one of Jesus' siblings after his death intrigued me. although the story focused more on the prostitute whose son died and Pilate's first in command, it was very interesting to think about the implications of Jesus' words to those who knew and "followed" the Torah. this story obviously focused on jesus saying "he who is without sin can cast the first stone." I love this author. Even though I enjoyed her book "Madman" better than this one, I was still captivated by this story. She does SUCH a wonderful job of creating characters that you can see and know in your mind. She doesn't gloss over personality, which adds to much depth to a story. It's wonderful. I was a blubbering mess by the end of this book! LOVED LOVED LOVED IT!!!! Can't wait to check out more of her novels. Christian fiction...still not my thing but this book was interesting enough to carry through the end. Tracy and her husband have three grown sons and a daughter-in Tracy Groot is the critically acclaimed and Christy Award–winning author of several works of historical fiction. Her books have received starred Booklist and Publishers Weekly reviews and have been called "beautifully written" and "page-turning" by Publishers Weekly, and "gripping" with "exquisitely drawn" characters by Library Journal.